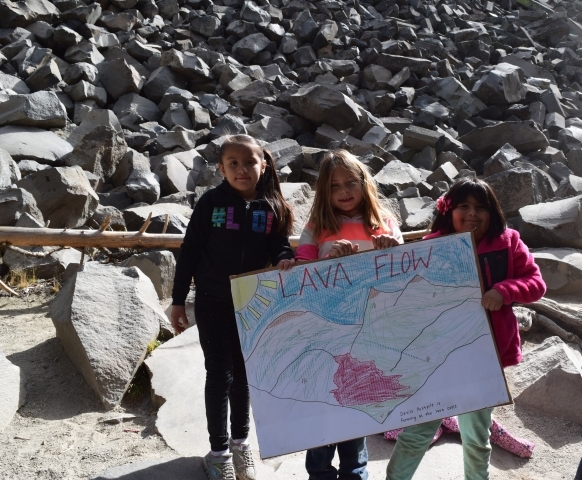 Claudia Moya-Tanner’s son Bo explored Devils Postpile National Monumental with Bishop Second Graders on a project supported by Friends of the Inyo. Check out Claudia’s editorial, published in the Inyo Register on December 6. Exploring public lands through the eyes of children. There’s no better way to experience a sense of wonder than through the eyes of a child. For me, that means frequent trips with my son Bo to Devils Postpile National Monument, the protected public lands in our own backyard. The Monument has long been Bo’s playground, and one of his favorite places to learn, explore, and be a kid in the purest sense of the word. 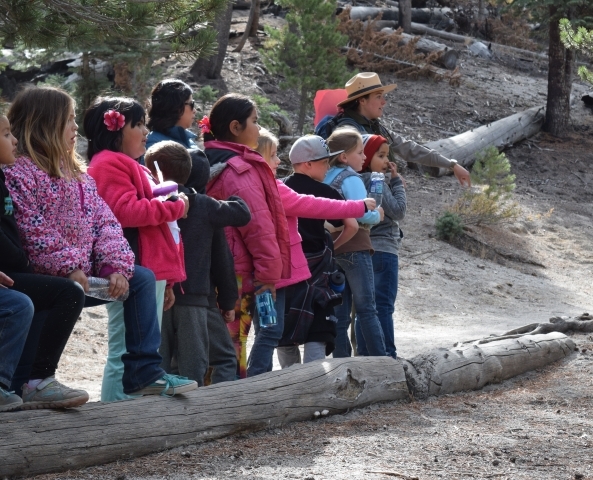 Just recently we had the opportunity to celebrate the National Park Service Centennial by taking a trip to the Postpile with Bo’s 2nd grade class at Bishop Elementary School. It was an eye-opening experience for students and parents alike — we learned how the formation was shaped by both volcanoes and glaciers almost 100,000 years ago. We studied flora and fauna, and marveled at the columnar basalt of the Devils Postpile formation. My son reveled in playing tour guide to his friends, many of whom had never been there before. The rare geologic formation of Devils Postpile is just one of the protected public lands in California’s Sierra Nevada, part of a broad system of parks, forests, monuments, wilderness and public lands. These places are national treasures of which we’re all essentially owners, and they provide a variety of experiences and opportunities for discovery. Devils Postpile is both a stone’s throw and a world away from the pressures of everyday life — it’s important we remember to get out and explore this special place, and be part of its public lands legacy. Every time my family goes to the Postpile we learn or notice something we hadn’t before. Bo’s excitement gets our whole family excited. He’s constantly pointing out new rock formations, observing unique ways the rocks rest on one another, or finding new ways to explore what we call “The Turtle Shell” (see how some of the smooth, eroded tops of the basaltic columns come together for the reptilian resemblance). He likes to ask the rangers questions, call out fleeting glimpses of wildlife, and meet people from all over the world who have come to visit his point of pride. My son’s wide-eyed curiosity reminds me to put the world on pause and just be present with nature. Young children have so many questions, and are constantly, endlessly learning. These visits provide an opportunity to really stop and pay attention to their queries. It’s precious time to reflect and be present as a parent with your child. Bo’s recent trip to the Postpile was made possible by Bishop Unified School District and Friends of the Inyo, who made sure every 2nd grader had the opportunity to experience the wonders of Devil’s Postpile and celebrate our National Park Service’s Centennial anniversary. I encourage parents to visit our local landmark with their children, and to experience the wonder through their eyes. Families can visit Devils Postpile National Monument and other federal public lands through the Obama Administration’s Every Kid in a Park program (www.EveryKidInAPark.org), which was recently extended for another year. This program ensures that every 4th grader and their family has the opportunity to visit and enjoy the outdoors through a pass for free access to federal lands and waters nationwide for a full year. My family’s quality of life and our relationship with each other has been shaped by our time on public lands. I invite families in our community to share in this experience, and in these special places that belong to all of us. Claudia Moya-Tanner is co-owner of Red’s Meadow Resort, outside of Devils Postpile, and a parent in the Bishop Unified School District.